Supporting Artists needed for a website promo in Belfast city centre on the 14th and 15th February. 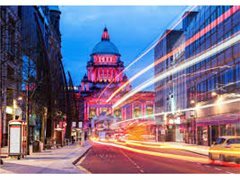 We require a number of 'Smart User's' to interact with Belfast city's new 'Smart Hubs'. The rate is a flat fee of £65.00 and we will need you for approximately 2 hours on either the 14th or 15th of February between the hours of 09:00am and 16:00pm. We are looking for a diverse range of people, from local city workers, to University students, to middle aged parents, pensioners and general high street shoppers. *Please only apply if you are local to Belfast city centre, as we will not be covering expenses for the shoot. This video is being used for online only.